Alex's Machine Knitting: Remember This? 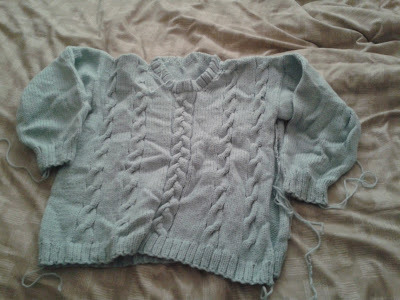 Here is a cabled Sweater that I made about a year ago and I had never been happy with it, the neck was always to wide and the body was never long enough, so I came across it today and I am going to pull it all out and make it into something else. I plan to make a sleeveless pullover in fisherman's rib on the Knitmaster 155 and ribber (obviously) but we'll see. I will post pictures of the yarn when it is all unravelled. Here is what it looked like before it gets pulled out.